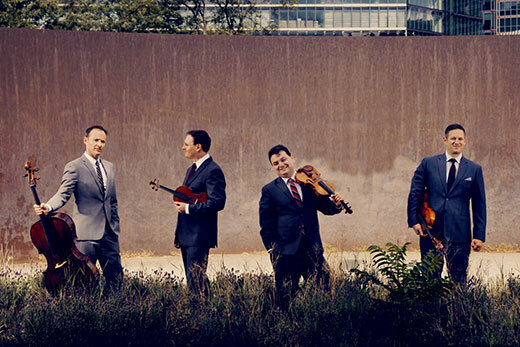 The Candler Concert Series brings international guests the Jerusalem Quartet to campus Oct. 10. The quartet will partner with husband-and-wife duo Pinchas Zukerman and Amanda Forsyth for an evening of late Romantic works. Photo by Felix Broede. From jazz performances on Patterson Green to international music guests, Emory’s October arts events take patrons outside the typical performance space and bring global voices to campus. The Emory Film and Media Studies department continues its fall Film Cinematheque Series, “Hitchcock/Hitchcockian,” Wednesdays at 7:30 in 208 White Hall with “Notorious” (1943), a three-episode screening of “Alfred Hitchcock Presents,” “Rear Window” (1954) and “Vertigo” (1958). All screenings are free and open to the public. Music at Emory brings audiences outdoors with free Jazz on the Green concerts on Oct. 4 and Oct. 18 at 6 p.m. on Patterson Green. The Candler Concert Series brings international guests the Jerusalem Quartet with Pinchas Zukerman and Amanda Forsyth to perform a redolent and dramatic evening of late Romantic works, including Strauss’ “Capriccio” and Tchaikovsky’s “Souvenir de Florence,” on Wednesday, Oct. 10, at 8 p.m. Tickets are $70; Emory students $10. On Wednesday, Oct. 31, at 8 p.m., Daniel Hope and Friends perform “Air–A Baroque Journey. Tickets are $50; Emory students $5. Both of these concerts are held in Emerson Concert Hall of the Schwartz Center for Performing Arts. As part of the Emory Chamber Music Society of Atlanta (ECMSA), virtuoso pianist and prize winner Momoro Ono will perform a free concert on Friday, Oct. 19, at noon in Ackerman Hall of the Carlos Museum. The ECMSA’s Family Series features “Just Jazzin’ Around’ on Sunday, Oct. 21, at 4 p.m., also in Ackerman Hall. On Saturday, Oct. 27, Emory’s Vega String Quartet with pianist William Ransom, cellist Charae Kreuger and violinist Helen Kim will perform Best of Beethoven Concertgebouw Preview, a preview of chamber music they will perform in November in a debut concert at the prestigious Concertgebouw in Amsterdam. The free concert is 8 p.m. in Emerson Concert Hall. The Department of Music continues its tradition of stellar Family Weekend concerts this year. On Saturday, Oct. 20, at 8 p.m., the Emory University Symphony Orchestra welcomes Schwartz Artists-In-Residence and Buenos Aires Tango musicians Sonia Possetti and Damián Bolotin to present an evening of Latin American orchestral works. On Sunday, Oct. 21, at 4 p.m., the Emory Wind Ensemble combines with Atlanta Symphony Orchestra musicians Stuart Stephenson and Emily Brebach for an exciting afternoon of wind concerti. Rounding out the month for Music at Emory, the Emory University Chorus combines with the Emory Concert Choir and chamber orchestra to bring French composer Gabriel Fauré’s Requiem to life in Sudden Light on Friday, Oct. 26, at 8 p.m. All of these concerts are free and will be held in Emerson Concert Hall. Theater Emory begins its Fall Repertory on Tuesday, Oct. 23, with “The Elaborate Entrance of Chad Deity.” Theater Emory presents three unique plays in rotating repertory through Nov. 11, with shows featuring professional Atlanta actors and Emory students. Tickets are $15 general admission, $12 discount categories and $5 students. Pay-what-you-wish nights are also held. Performances are held in the Mary Gray Munroe Theater. The Emory Dance Program welcomes New York City-based maker, teacher and performer Kendra Portier for an informal showing of her work on Tuesday, Oct. 23, at 7:30 p.m. Portier’s dance works evolve through her visual arts practice and transdisciplinary interests in mathematics, science, pedagogy and somatics. The showing, which is free, will be held in the Dance Studio of the Schwartz Center. Join the Michael C. Carlos Museum on Sunday, Oct. 14, from 2-4 p.m. for a culinary exploration of vegetables native to the Americas in “Cooking Class: Heirloom Beans with Rancho Gordo.” The event is $15 for Carlos Museum members; $25 for nonmembers and registration is required by calling 404-727-6118. Continue to explore the Americas on Thursday, Oct. 18, from 7:30-8:30 p.m., when Megan O’Neil, assistant professor of art history and curator of Art of the Americas, delivers a lecture titled “Touch and Tactility in Maya Art.” This lecture is free. Both events will be held in the Carlos Museum’s Ackerman Hall. The Creative Writing Program Reading Series 2018-2019 continues with The Phillis Wheatley Reading with poet Terrance Hayes on Wednesday, Oct. 24, at 6:30 p.m. and a Colloquium with Terrance Hayes on Thursday, Oct. 25, at 2:30 p.m. The reading will be held in the Jones Room of the Woodruff Library and the colloquium in Room N301 of the Callaway Memorial Center. All events in the series are free.